As any homeowner knows, leaks happen. And when they do, you need to find and correct them quickly. Minor and major leaks alike can lead to huge expenses and significant property damage. At Lightfoot Mechanical, we are here to help with leak detection in Fort Worth, TX and the surrounding areas. We’re experts when it comes to detecting and correcting leaks, and we can save you thousands of dollars. Leaks often develop in areas that are hidden from view, such as behind walls, in basements and under slabs. You might see dripping, puddles or water damage in one area when the actual source of the leak is somewhere else. That’s why it is so important to call for professional leak detection. Without knowing the exact location of leak, it’s impossible to make the right repair. Our plumbers in Fort Worth use state-of-the-art equipment to pinpoint even the tiniest leaks without damaging your home. With our leak detection equipment, we can find leaks without cutting into your walls. This saves you a lot of money and allows us to find and correct the problem quickly. A small leak like a faucet that won’t stop dripping may not seem like a big deal, but putting off repair could cost you big. 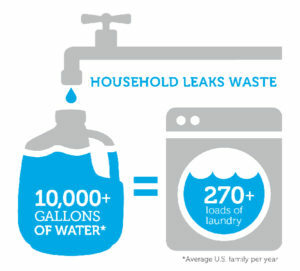 In fact, leaks make up for as much as 14% of the average household’s water consumption. Why let all that money run down the drain? At Lightfoot Mechanical, we can help with all your leak detection needs. Whether you have a major problem like a burst pipe, a leaky faucet or anything in between, we can get to the bottom of the problem and solve it once and for all. To schedule an appointment, please contact us today by calling 817-596-0309.